April 7, 2016 – The 2001 Mars Odyssey designed and built by Lockheed Martin Space Systems for NASA and the Jet Propulsion Laboratory (JPL) was launched on this date fifteen years ago. While in orbit, the spacecraft has collected data that has been used to analyze the global elemental composition of the planet, searched for evidence of ancient hot springs and mineral deposits, surveyed the radiation environment and provided a communications link with Mars landers. Back-to-back failures of two Mars missions launched in 1999 had prompted an overhaul of NASA’s Mars plans, but fittingly, a new era in Mars exploration came at the dawn of a new century when the 2001 Mars Odyssey mission discovered huge deposits of hydrogen near the northern polar region of Mars. And not only has Odyssey itself operated successfully longer than any other spacecraft ever sent to Mars, but during Odyssey’s lifespan so far, all six subsequent NASA missions sent to Mars have also succeeded. 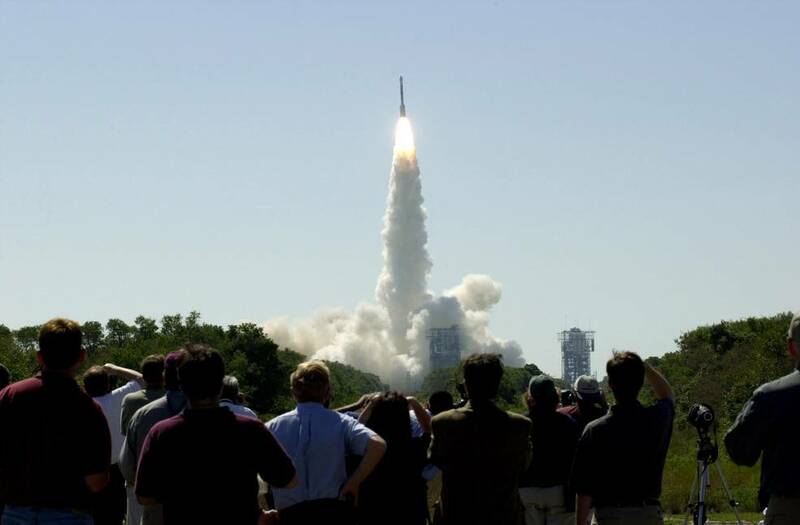 A Delta II launch vehicle lifted Odyssey from Cape Canaveral Air Force Station, Florida, on April 7, 2001. When the spacecraft reached Mars on October 24, 2001, it fired its main engine to enter orbit. After an initial elliptical orbit, the flight team performed aerobraking maneuvers for several weeks to place the spacecraft in a lower, nearly circular orbit around the planet’s poles, averaging 250 miles above the surface. Odyssey’s primary mission was two Martian years (46 Earth months) and concluded August 2004. Since then the bonus years of extended missions have enabled many accomplishment that would not have been possible otherwise. On December 15, 2010, Odyssey became the longest working Mars spacecraft in history when it passed the record of 3,340 days set by the Mars Global Surveyor. Lockheed Martin Space Systems of Littleton, Colorado, built the Odyssey spacecraft and collaborates with JPL in mission operations. Some of Odyssey’s important findings were accomplished within the first year after launch. One suite of instruments found evidence of water ice close to the surface in large areas of Mars. Another investigation measured the natural radiation environment on the way from Earth to Mars and in orbit around Mars, gaining information vital for design of human missions in what has become NASA’s journey to Mars. In the past year, Odyssey’s orbit has put the spacecraft in position to observe Mars in early-morning light. Previously, the spacecraft flew over ground that was either in afternoon-lighting or pre-dawn darkness. Maneuvers in 2014 and 2015 were designed to alter the geometry of the orbit with respect to the sun. The new geometry enables studies of morning clouds and fogs and comparison of ground temperatures in the morning to temperatures of the same sites in the afternoon and pre-dawn. In addition to its direct contributions to planetary science, Odyssey provides important support for other missions in NASA’s Journey to Mars through communication relay service and observations of candidate landing sites. More than 90 percent of the data received from NASA’s Spirit and Opportunity rovers has been relayed via Odyssey. 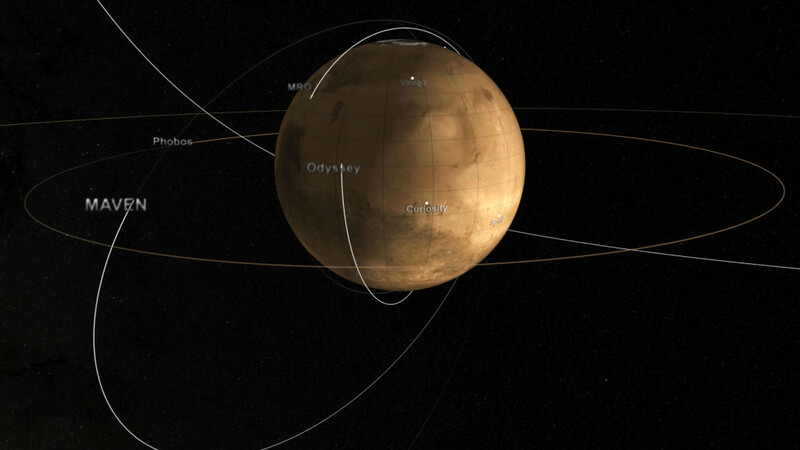 Relay support for NASA’s Curiosity Mars rover is shared between the Mars Reconnaissance Orbit (MRO) and Odyssey. Odyssey was the second Mars orbiter designed, built and flown by Lockheed Martin for NASA and JPL. The first was Mars Global Surveyor which operated in orbit from September 11, 1997 to November 2, 2006. Following Odyssey was the Mars Reconnaissance Orbiter which entered orbit on March 10, 2006 and is still in operations, and the Mars Atmosphere and Volatile EvolutioN (MAVEN) mission which entered orbit on September 21, 2014 and is also still operating. Detection of copious hydrogen just below the surface throughout the planet’s high-latitude regions. Deduction that the hydrogen was frozen water prompted NASA’s Phoenix Mars Lander mission, which confirmed the frozen water in 2008.